Heavy-duty, universal design provides a stylish way to hold your patio umbrella firmly in place. Base Dimensions: 18" diam., 12"h.
Pole Holder Dimensions: Up to 1.875" diam. umbrella poles. 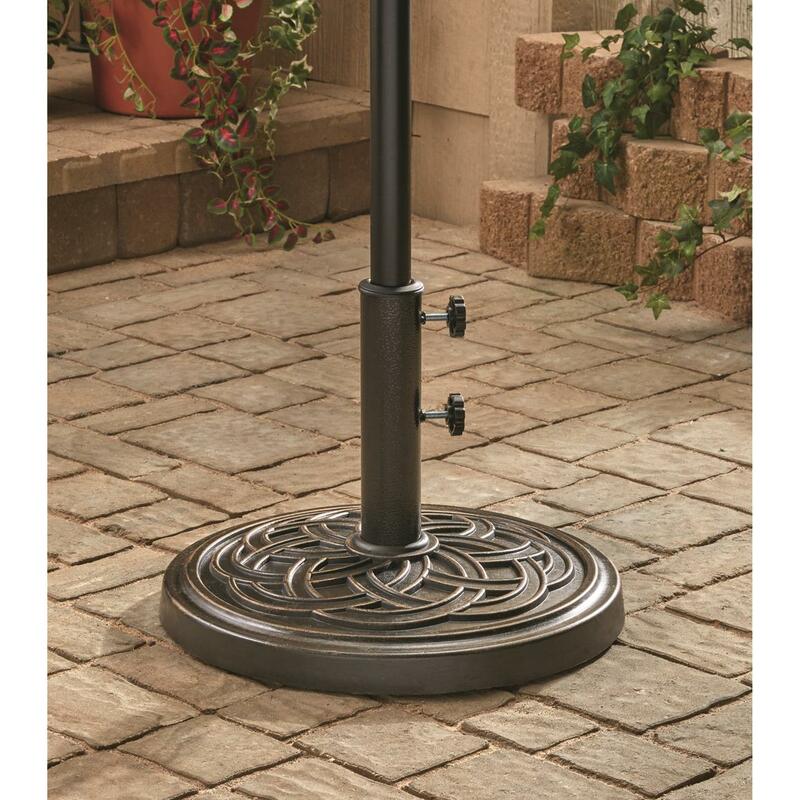 CASTLECREEK Bronze Patio Umbrella Base is rated 4.3 out of 5 by 131. 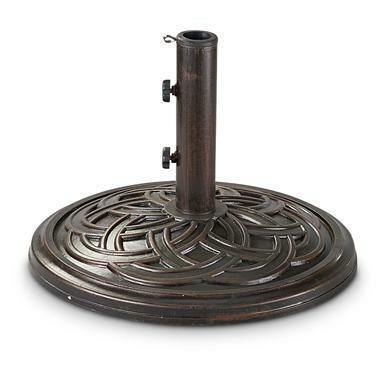 Rated 5 out of 5 by Jackie T from Great stand The umbrella stand looks great and Is sturdy. Rated 5 out of 5 by George996 from Works Well Holds up good to a stiff breeze. So far so good. Rated 1 out of 5 by STK1 from Broke too easily! Bought several of these stands and they didn't last more than a year. Cracked, then crumbled, trash. Rated 4 out of 5 by Rickie63 from Different From The Previous One One Thing Was Different From My Previous Purchase, >There Were Two Different Plastic Rings For The Top of The Pole. One Fit Fine Into The Interior Of The Pole Top. The Top Ring Was Too Small For The Umbrella Pole To Fit In. Maybe A Manufactoring Defect. Got Rid Of The Top Ring And The Bottom Ring Held The Umbrella Strait When The Pole Screws Were Tightened. But Still As Good As The Last Purchase. Rated 5 out of 5 by LizC from Very Nice Stand This is a very heavy and very attractive umbrella stand. It perfectly matches my patio furniture and it is heavy enough to secure the umbrella. This is important here because we live in a very windy place. Rated 5 out of 5 by El Jefe2018 from It sits on the patio and doesn't move. Good stand. The stand does just what you tell it to do, it sets on the floor, doesn't move. What more can you ask for. Rated 5 out of 5 by yety1 from Great Item!!!! Base is really heavy and sturdy, Umbrella has nowhere to go even in moderate relentless Santa Ana winds.